NPR is working to help more stations contribute to NPR One, its streaming audio app that has proven successful at drawing new listeners to public radio content since its launch in 2014. The largest age group listening to NPR One is 25- to 34-year-olds, according to NPR, with 40 percent of listeners under 35. More than a third of users who answered NPR surveys said they never or only occasionally listen to broadcast radio. And the audience is sticking around. According to NPR data, the average user listens to NPR One for nearly two and a half hours a week. There could be benefits for broadcast as well: More than a quarter said they are listening more to NPR on terrestrial radio after starting to use NPR One. NPR One gives listeners a continuous stream of NPR News segments, mixed with local coverage targeted to the listener’s location. Nearly all NPR member stations that aren’t music-only can be found through NPR One, according to the network. Of those, about two-thirds are contributing local content to the platform. “That number continues to grow as we make it easier to do so,” said Tamar Charney, local editorial lead for NPR One, who was hired earlier this year for the new position after working as program director for Michigan Radio. NPR hired Charney to “make sure that NPR One feels local, better represents local news and shows, and directs NPR One’s growth to support station priorities,” according to an NPR memo announcing her hiring. Charney spent her first months on the job meeting with station staffers and sharing best practices to improve NPR One for stations already using it. “NPR One was really designed to be a way to acquire new audience for public media as a whole, but also for stations,” Charney said. NPR One’s success in reaching new audiences comes at a time when the network’s broadcast shows have been losing ground among younger listeners. Last fall, NPR research showed declines in average–quarter-hour listening from spring 2010 to spring 2015 in every age group except 65+. Total broadcast audience during morning drive time dropped 11 percent over that time. NPR projected last fall that by 2020 listeners 44 and younger would make up around 30 percent of NPR stations’ audience, half that group’s share in 1985. “What NPR One is starting to suggest is, it’s not the content — it’s been a platform problem to a large degree,” Charney said. That NPR One appears to appeal to a younger audience is “incredibly exciting for the future,” she said. NPR One rolled out in July 2014 as “Pandora for public radio,” with the promise of giving listeners more control over what they hear. Listeners’ skipping and rating of segments informs an algorithm that refines story selection. Users can also listen to podcasts produced by NPR and stations, which are featured in their own section of the app. As of last year, NPR One had been downloaded more than 650,000 times, according to the Pew Research Center’s latest State of the News Media report. The NPR News app, launched in 2009, had about 1 million downloads last year. NPR declined to disclose the number of users but said that it has grown by 10 percent each month. This comes despite the network shying away from heavy marketing for NPR One. When it introduced the app, it delayed promotional efforts until after stations’ fall pledge drives. And earlier this year, in a memo that ended up drawing much attention, Chris Turpin, NPR’s v.p. for news programming and operations, directed news staffers not to promote the app on NPR’s broadcast programs. Lara did not specify when NPR might begin promoting NPR One on air. But the network is preparing a marketing campaign for NPR One “designed to reach digital natives,” she said. The app has also given NPR and member stations an unprecedented amount of data about what interests listeners. Local newscasts are the least-skipped NPR One content, according to Charney. Data on whether a user listens to, shares or marks a local newscast as “interesting” are top indicators of whether they will return. As NPR One proves its ability to reach new listeners, the network is still trying to bring on board stations that have yet to provide content for the app. 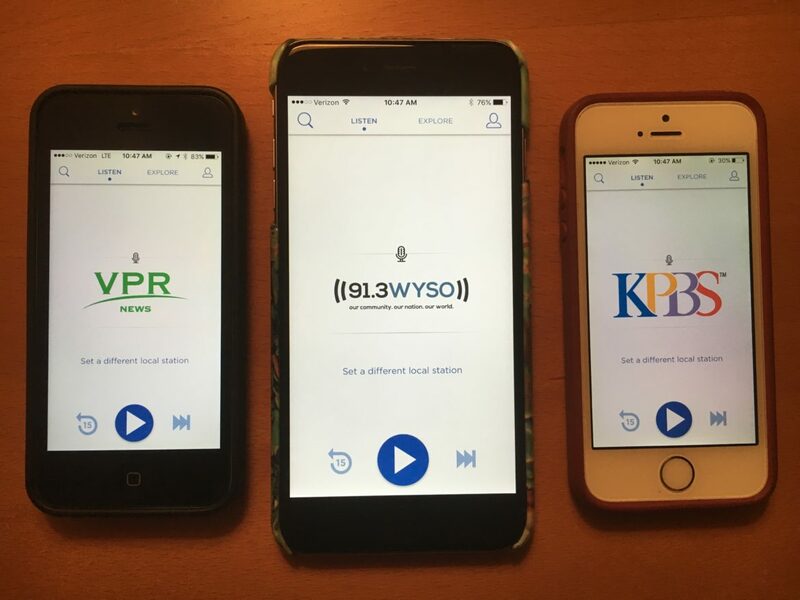 Station staffers using NPR One suggest possible improvements to the app. At KPBS local features often exceed four minutes, to fit into the station’s broadcast clock, said John. But NPR One favors stories under four minutes because listeners are more likely to play shorter segments all the way through. The station has already found success in using NPR One to promote a local podcast. John said that a promo spot in the app helped boost monthly downloads of KPBS’s Cinema Junkie podcast from 7,000 to around 21,000 over six weeks in rotation. Stations should also have more control over how podcasts appear in the app, said WYSO’s Fromholt. Local podcasts that are listed on NPR’s website currently appear in NPR One’s podcast section. But “sometimes, for a variety of editorial reasons, I would rather that piece of audio just be in the regular story stream, not in the podcast stream or as a podcast,” Fromholt said. Removing a podcast from NPR One also deletes it from NPR.org. Ultimately, though, Fromholt said she believes NPR One will help stations develop and showcase their best possible work. Though NPR One offers some clear benefits to broadcasters, it may also face challenges as NPR works to sign up more stations. “NPR One is unraveling a whole bunch of trust issues” between NPR and stations, said Jonathan Butler, director of digital services at Vermont Public Radio, which feeds content to NPR One. NPR stations have always owned their towers and been in direct contact with listeners — and their wallets. “When someone calls up and supports public radio, they’re sending that check to VPR, and they’re putting their name in VPR’s membership database,” Butler said. But with NPR One’s users, their information goes to NPR first and is shared with stations later — “totally inverse” of the NPR-station relationship to date, Butler said. Charney said the app does allow stations to email registered users, and it can direct users to donation pages on websites. It also aims to send user data to stations that can be used for donor cultivation. “At the same time the app is attracting new listeners to our content, it is generating new prospects for stations to engage as potential members,” Charney said. But Butler said stations’ concerns will persist as long as NPR owns and operates the first point of contact for users. “Those trust issues need to be addressed through the whole system, so we can just get past them and then just get on to the promise of NPR One,” Butler said. Despite the issues that remain to be worked out, Butler said he’s a “big fan” of NPR One and that VPR has received positive feedback from listeners for its integration with the app. Correction: An earlier version of this story inaccurately said that NPR had suspended promoting NPR One on its broadcasts. It had never promoted NPR One on the air, according to an NPR spokesperson. NPR’s Sara Sarasohn explains what the network is learning about the listening habits and preferences of NPR One users. The trust issues COULD have been address and solved from the first day the app was launched…but they weren’t. And it’s been over two years and they still haven’t been addressed. How do the survey results on age compare to the estimates by Google Analytics on the age of users?